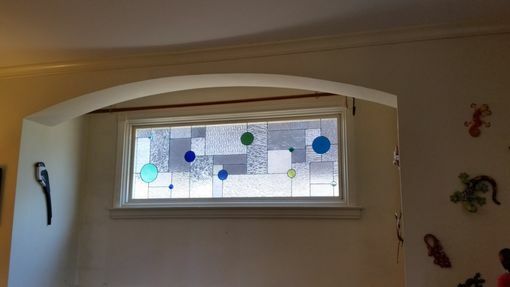 This simple but fun stained glass window is already decorating our customer's home and you can see the difference it makes, comparing the before and after photos. Finished size including the frame: 69 1/8 wide X 25 1/4 tall. Frame is oak 1" grooved for lead came. -Shipping cost to be determined by location. 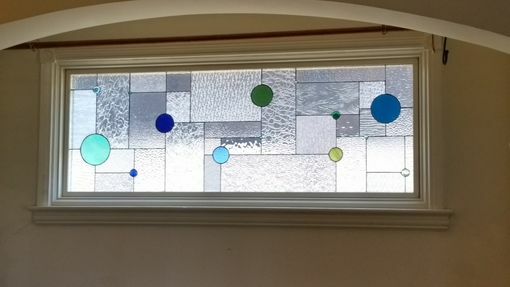 This piece is a different version of our Clear & Amber - Geometric Hanging Panel (GS-2).